The London Eye, also known as the Millennium Eye is a gigantic Ferris wheel situated on the banks of the River Thames in London, England. It is 135-metre or 443 ft tall. Could you imagine riding this wheel and see the surroundings of London. I guess I am lucky to ride this famous wheel once in my life. "The wheel carries 32 sealed and air-conditioned ovoidal passenger capsules, attached to its external circumference, each capsule representing one of the London Boroughs. Each 10 tonne capsule holds 25 people, who are free to walk around inside the capsule, though seating is provided. It rotates at 26 cm (10 in) per second (about 0.9 km/h or 0.6 mph) so that one revolution takes about 30 minutes." 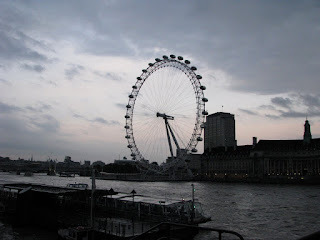 Don't miss to ride this wheel if you want to have a good view of London. taken during my visit last October 2008. The Ferris had previous names. It is also called as the EDF Energy London Eye, formerly the Merlin Entertainments London Eye. It is the tallest Ferris wheel in Europe. I guess the tallest in the world now is located in Singapore.